Some Bay Area offices boast gourmet cafes and nap pods, but one in Redwood City looks — and smells — dramatically different. Sewage water from some Peninsula cities is collected and treated at Silicon Valley Clean Water in Redwood City. And whiffs of thousands of tons of sewage sludge are unmistakable from the lunch patio at Bioforcetech Corporation, located just steps from its new plant. "Its smell – you kind of get used to it," said Dario Presezzi, the chief executive officer at Bioforcetech. "We’ve been giving almost 12 hours a day, every day – night times sometimes – because it’s been extremely challenging." Presezzi and his team of Italian-born engineers and specialists came to Silicon Valley to turn waste to energy in a process he says is not yet allowed in their home country. "It was just the biggest challenge that was out there, to make energy," Presezzi says. Since solar panels and wind turbines didn't interest him, Presezzi and his team began working with the out-of-sight, out-of-mind tons of sewage sludge running through tunnel systems underground. Sewage sludge is the human urine and feces that drain from people's toilets. Through this process, it is dried and processed into biosolids, which is the name given for recycled and processed sewage. 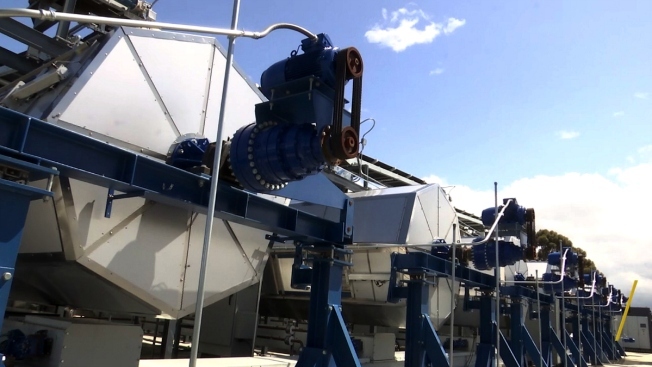 After it is drained of about 70 percent of its water weight, Bioforcetech runs the biosolids through a flameless burner to create biochar, a charcoal-based fertilizer. While human waste has been stored, dumped in oceans, soaked in lagoons or piled up in landfills, this process will allow the sewage sludge of about 100,000 people to be sold as fertilizer early next year. That’s larger than Redwood City’s population. "Upcycling," Presezzi calls it. "We’re taking a waste that has no value and we’re actually creating value from that waste." Built to run on human waste, the process not only creates energy but runs on itself. Through its self-sustaining process, the use of biosolids has become a cheap alternative to waste disposal. Presezzi has offered quotes to approximately 20 other plants, offering to lower costs to as low as $20 per ton for the disposal. Other processes may cost $50 to as much as hundreds of dollars per ton to dispose of the waste. However, the use of biosolids as fertilizer is more than a bit stinky, it has an added hurdle of gaining public approval. Baked with chemicals, bacteria, hormones and medications, critics say current Environmental Protection Agency regulations aren't enough. Just outside of Los Angeles, voters in Kern County voted overwhelmingly to ban the use of Los Angeles human waste as fertilizer at the Los Angeles Green Acres Farm. The city sued — and won. More than a decade later, the courts sided with biosolids ruling that a ban violates the Integrated Waste Management Act, which requires jurisdictions to promote and maximize recycling of waste, including for land application. "There is a lot environmental communities that want to stop this because there is pharmaceutical products and other bad bacteria inside of it that gets spread into the soil," Presezzi said. However, he says the soil undergoing the drying and heating process at his Silicon Valley plant is clean and doesn't use additives, fossil fuels or chemicals in its process. "This system just get rid of that, it collects the good parts," Presezzi said. Presezzi says the new plant is on track to complete its first full-scale process of 7,000 tons of human waste over the next year.